Hi all, in this post we are going to explore how to use carbon admin services and how to consume them properly. There are lot of carbon admin services available for WSO2 Carbon based product. To list out all the admin services follow the below steps. 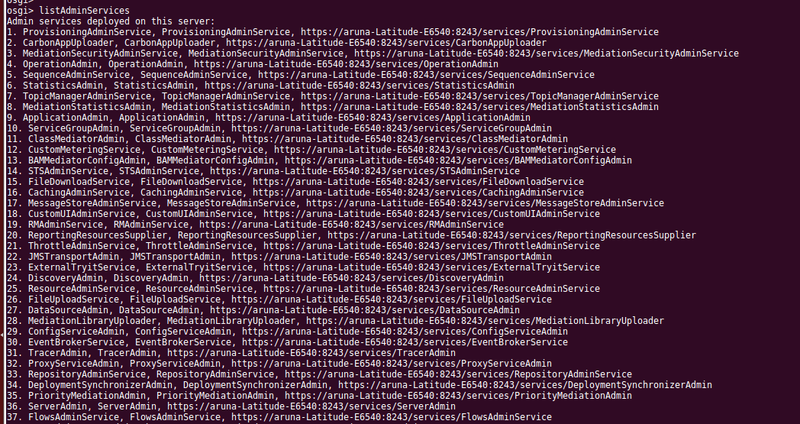 Then type listAdminServices in the Osgi Console. Now you can see all the available admin services. By default these admin services are hidden. If you try to access a service using browser. you'll get the following error. The endpoint reference (EPR) for the Operation not found is /services/ProvisioningAdminService and the WSA Action = null. If this EPR was previously reachable, please contact the server administrator. To enable hidden admin services in Server-Home/repository/conf/carbon.xml file set the following value to false. Then you'll see the wsdl file of the service available. Here is a sample admin service client to demonstrate an uploading a carbon application to the server. You can find the source code in this repository.